You won’t find scones listed on the menu as an option but I ask anyway. I thought, since they were serving High Tea in the Atrium Lounge near the lobby in the Hotel Chancellor, I’d have a chance. When placing my order the bar attendant asked me several times whether it was for one and I thought it strange at the time but when it finally arrived (it took a while) there was only one scone, so I understood his dilemma. The scone was underwhelming: a bit dry with an unpleasant aftertaste, and it even looked unappealing. Served with a good quantity of jam and cream, it’s a shame that the quality of the scone didn’t match the five-star brand. Tea: A teabag in a large pot with herbal varieties. Overall: A bit sterile but bright and has views to the harbour. On a previous visit to Hobart, I had, against my better judgement, eaten at Dome. When I see the Devonshire Tea on the menu, I’m not convinced, but knowing I have to review all possibilities I forge ahead. I’m confused why the menu says that they serve ‘two fluffy scones accompanied by whipped cream and jam’ when the scones are toasted – there’s nothing fluffy about toasted scones, they taste old. 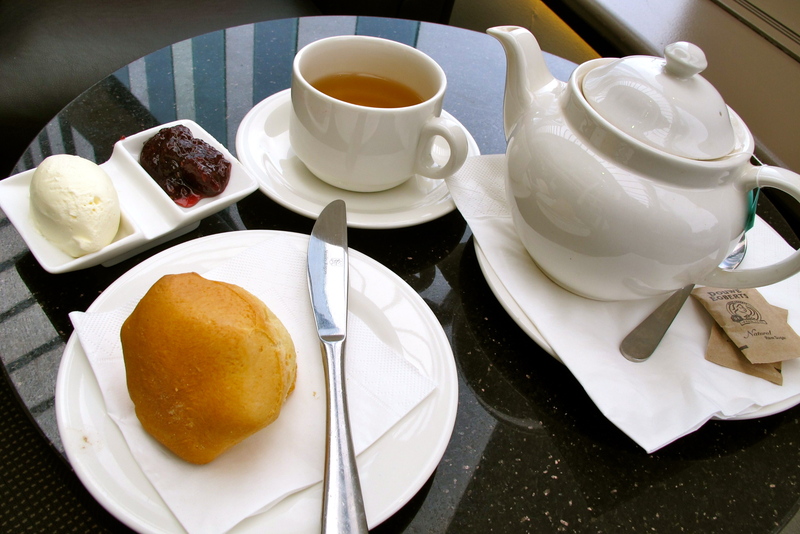 I’m excited about the list of loose-leaf teas, but they’re overrated. I ask for the mixed berry jam out of three interesting choices, but end up with raspberry and rhubarb, which sounds better than what it is. The whipped cream is also too light. I know the leather chairs look inviting but there are far better options in a state that is overloaded with Devonshire Teas. Dome Cafe franchises are huge in WA, with a few others in Tasmania, one in Darwin and internationally in Bahrain, UAE, Malaysia, The Philippines, Maldives and Singapore. Tea: A good variety of loose-leaf teas that looks impressive behind the counter. Overall: Nice chairs but don’t be fooled. Who doesn’t love a visit to a Botanical Garden? Manicured lawns, interesting flora, pretty flowers and huge trees, the list is endless. The Royal Tasmanian Botanical Gardens in Hobart even has an exhibit that is quite popular especially on those rare scorching hot days. The sub antarctic room is a cool eight degrees and houses plants found on Macquarie Island in the Southern Ocean, and for Australians, Tasmania is the closest we get without actually visiting. There’s also a carousel in the grounds the day I visit which you don’t see very often, Canberra is the only one that comes to mind! The restaurant shares the same building as the Visitors Centre and is a lovely place for a family lunch or lunch with friends. We sit on the verandah that looks out over the gardens to the Derwent River; everything looks schmick, until my Devonshire Tea arrives. The scones look like a couple of bread rolls and are a bit rubbery. Although the whipped cream is real, rather than from a can, it’s too light. The raspberry jam is lovely but there’s too little of it to give the scones some flavour. Tea: Six types of tea (tea bags) available, including three green and herbal varieties served in an unimaginative pot. Overall: A wonderful view from the verandah. I’m not a beer drinker, but I do love historic buildings and touring them. The Cascade Brewery in South Hobart is well-known in beer drinking circles and non beer swillers may have sipped their Mercury cider or non-alcoholic sparkling apple juices. Australia’s oldest operating brewery, it was built in 1824 to quench the thirst of the penal colony down the road in Hobart town and the pure waters that cascaded down off Mt Wellington was used to make their brews. There are three different tours available but the two-hour brewery tour is the most popular and ends in the bar where you get to try three brews of your choice, including the non-alcoholic varieties! A stone throw from the bright and inviting bar is the similar vibed cafe where in addition to an extensive menu you can get scones. The scones are surprisingly good, fresh on the inside and crispy on the outside, hearty and filling. They’re served with double thick cream and fairly average jam and a bit more of both would help tackle the big scones. Sit in the picturesque garden if the weather allows. Tea: A variety of teabag tea to choose from served on the side of a 3/4 filled teapot of hot water. Overall: A great view of the Cascade Brewery facade with Mt Wellington as the backdrop. This whole article has made me really hungry! Sitting at work with another 3hrs till lunch! Thanks! 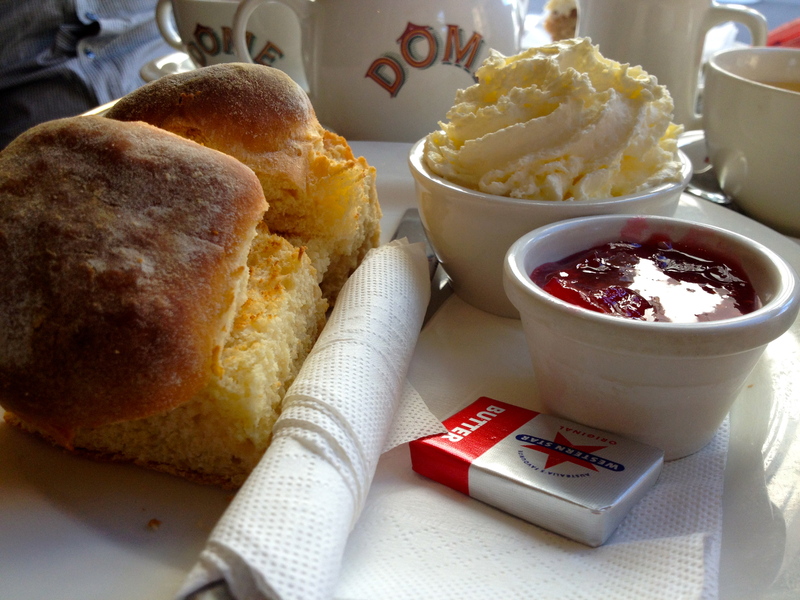 Three and a half weeks in hospital has me dreaming of a good Devonshire tea for when I’m able to eat. Who’d have though it’d be so hard to find a top class one in Tassie? I’ll keep reading your great and stalwart reviews in hopes there’s one somewhere on the way home near Launceston. And all this time I’ve been spruiking that Tassie has the best DTs in Australia (well definitely the most per capita!)!!! Well, now that my partner owns a shack in Ansons Bay, I’ll be exploring more Devonshire Teas in the state. I am yet to explore the Tamar Valley, and I believe the lavender farm does them. Hopefully I’ll get there at Christmas. 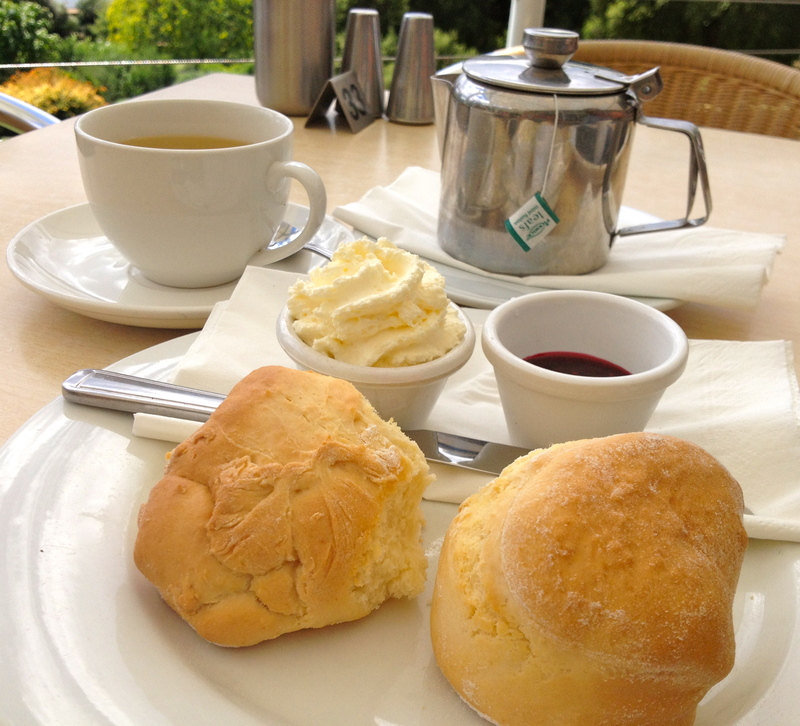 How are the scones at Cataract Gorge? 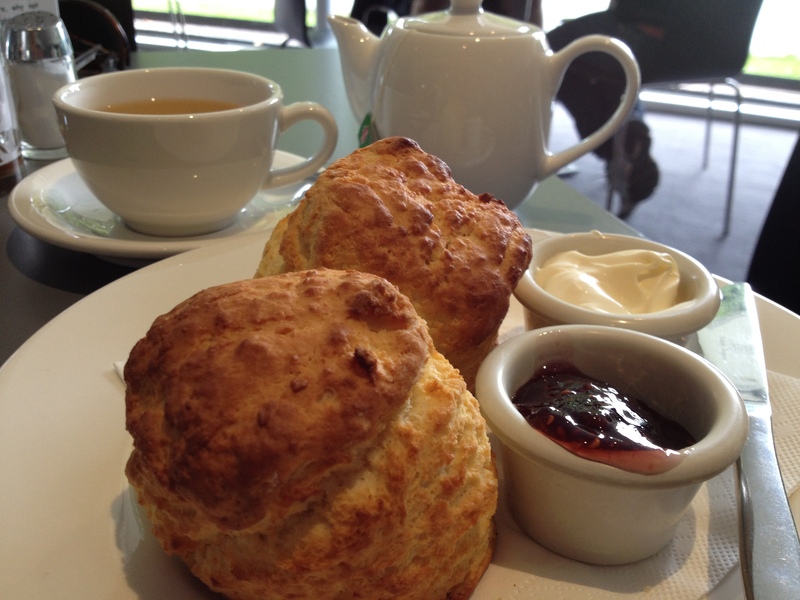 When I visited, I already had had several scones that day, and my partner wouldn’t let me stop! ;-) Next time though! I wish you a speedy recovery, so you can get chomping.